Campaign for the American Reader: Pg. 99: Carmel Finley's "All the Boats on the Ocean"
Pg. 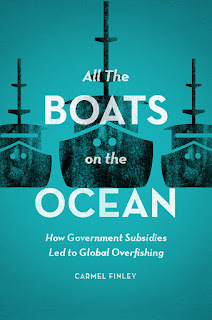 99: Carmel Finley's "All the Boats on the Ocean"
Featured at the Page 99 Test: All the Boats on the Ocean: How Government Subsidies Led to Global Overfishing by Carmel Finley. The Page 99 Test: All the Boats on the Ocean.